We’ll build on the test suite we’ve working on in this series on Moq. This is the last post dedicated to Moq in the TDD series. Strict mocking means that we must set up expectations on all members of a mock object otherwise an exception is thrown. Loose mocking on the other hand does not require explicit expectations on all class members; instead default values are returned when no expectation is explicitly declared. Default behaviour in Moq is loose coupling. Run the tests and Then_repository_save_should_be_called() will fail. The exception thrown reads as follows: IProductRepository.Fetch() invocation failed with mock behavior Strict. Moq saw an interaction with the customer repository that was not set up properly so it threw an exception. We often have base classes for related objects where common behaviour and abstract properties and methods are contained in the base. We want to be able to verify that the derived classes made the call to a method or property in the abstract class. Let VS create the missing classes and methods for you a we saw in previous blog posts in this series. As we said we want to verify that a certain method is called in the base class of the ProductPropertySetter object. Note that we create a mock of the object that we want to test. It is not some interface dependency we want to mock but the system under test itself. The Object property will then yield the implementation of the mocking. Finally we call the SetBasicProperties on the mock object. This time do not let VS create the method for you as it will insert it in the ProductPropertySetter class. Instead insert an abstract class called PropertySetterBase in the Domain layer and have ProductPropertySetter derive from it. Insert a method called SetProperties in PropertySetterBase which accepts a Product object. This should get rid of the compiler error. Run the tests… …you should still see that the new test method fails. Remember the problem we had in the previous post, that we had to help Moq with the ‘virtual’ keyword? We have the same case here. Insert the ‘virtual’ keyword in the signature of the SetProperties method and then the test will pass. We looked at recursive mocking in this post where we looked at how mock a chain of properties. There’s another form of recursive mocking: say that a class has a dependency which then creates another dependency within one of the class methods. A classic example is a factory that builds some other object based on some inputs. This other object is then an indirect dependency which the class uses in some way. We would like to be able to verify that the appropriate method of the dependency injected by the factory was called. 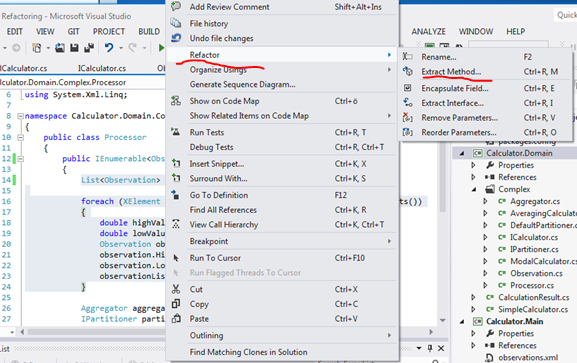 Create the missing objects and methods using Visual Studio. The test should pass meaning that we successfully verified that the CreateAddressFor method was called on a dependency injected by the factory which in turn was also injected in the constructor. At times you may be dealing with a lot of dependencies of an object. Many dependencies can point to different problems, such as the object is trying to achieve too much, but that’s beside the point here. We initialise a new MockRepository and we indicate the mock behaviour and the default value. These will be valid for all mock objects created by the repository, you don’t need to specify them one by one. Next we create the mocked dependencies for the ProductService using the mock repository directly. At the end we call the Verify method on the mock repository. This is a short-hand solution instead of calling Verify on each and every expectation we set up. The mock repository will go through each mock element and run the verifications accordingly. In some cases you may want to test that a protected member of a class was called. This is not a straightforward scenario as protected members are not available outside the class. Moq can solve the problem but it comes with some ‘buts’: there’s no intellisense as protected members are invisible; instead they must be referred to using strings. Also, instead of the ‘It’ keyword ‘ItExpr’ must be used. In addition, the protected member under test must be marked with the virtual keyword as we saw in previous examples. The Protected() extension method is the gateway to testing a protected member. Setup denotes the return type of the protected member. “GetResult” is the name of protected method under test and it is followed by the parameters the method accepts using the ItExpr method: in this case the imaginary GetResult method accepts one parameter of type string. We set up the method to return the string “hello” and mark it as Verifiable. If you miss this step then Moq will not be able to check if this expectation has been met. It does not make any difference if you call Verify in the Assert section at the end, the setup of a protected member must be marked as verifiable. This ends our discussion of the Moq framework. I hope you now know enough to start writing your own mock objects in your tests. So far in this series on Moq we’ve been concentrating on mocking methods, their return values and exceptions they may throw. However, we should not forget about object properties: setters and getters. Writing tests may become quite involved when we need to set up a hierarchy of properties: a property of an object is another object which has a property that is also an object which has a property etc. The demos build on the project where we left off in the previous post. The most basic test we can perform is check if a property has been assigned a value, i.e. the property setter has been called. We’ll add a property to ICustomerRepository called LocalTimeZone and see if that setter has been called when creating a new Customer. The test should now pass along with all the other tests. We want to be able to update a customer. The Customer object will receive a new property called RegionId which will be set using a getter of the ICustomerRepository interface. We want to make sure that this getter has a value, i.e. is not null. Note the addition of the Update method, let VS create it for you. As usual, let VS take care of the missing elements. The test should now pass. Another solution would be to turn BaseInformation, Settings and SystemConfig properties to interfaces, but I think in this case it would be wrong. They are object properties, not interfaces. This is the trade-off. In other mocking frameworks you may need to set up the expectations on each nest property one by one. Moq makes our lives easier by mocking up each property in the chain for us, but in turn we need to add the ‘virtual’ modifier. Run the tests and the current one should pass. Add the same setup to the other two failing tests as well. After calling SetupAllProperties we can set the value of each property as shown in the example. In the next post we’ll investigate some more advanced features of this mocking framework. In this post we’ll discuss how to verify arguments and exceptions using Moq. Arguments to our mock objects are important components. Therefore we should verify that the correct input parameters were passed to them. This will ensure that the right input data is used by the dependency injected into the system under test. Different parameters will also enable to us to check the behaviour of the system, e.g. by controlling the execution flow. Open the solution we worked on in the previous post. The domain experts say that the product ID should be somehow built based on the product name. We want to extend the IProductIdBuilder interface with an overloaded BuildProductIdentifier method that accepts the Name of the product. Then we want to verify that the input parameter passed to this method is valid. Note the String parameter passed to BuildProductIdentifier. 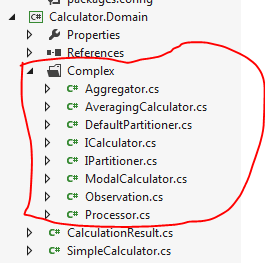 Let Visual Studio create the overloaded method in the IProductIdBuilder interface. If you recall from the first post on Moq this type of setup will help verify that the BuildProductIdentifier method was called when the Create method in ProductService.cs is called. Here we say that in the BuildProductIdentifier method we want to check that the parameter passed into it will be the same as the Name property of the product. Re-run the tests and you’ll see that the new test passes but we have two failing ones: The_product_should_be_saved_if_id_was_created() and Then_repository_save_should_be_called(). The reason is the same as above: we’re setting up the wrong BuildProductIdentifier method now that we have the new policy of creating the ID from the product name. I hope you’re starting to see the real power of TDD. The tests should now pass. You can even test the new test method by passing in the Description property of the Product object to BuildProductIdentifier in the Create method of ProductService. The test will fail because the expected Name property does not equal the actual value passed in. For the flow control demo we’ll work with a new object in our domain: Customer. The domain experts say that Customers must have a first and last name and should have a Status. The developers then translate the requirements into a simple code-branching mechanism when a new Customer needs to be saved: either save it ‘normally’ or in some special way depending on the customer status. This means that if the Status of the CustomerViewModel is Gold then the CreateFrom of the mock object should return Gold. Run the test and you’ll see that indeed the SaveSpecial route is taken and the test passes. We can set up the dependencies so that they throw some specific exception when invoked. This way you can test how the system under test behaves when it encounters an exception from a dependency. We’ll simulate the following: we want the IProductIdBuilder dependency throw an exception and check if the exception is handled correctly. This code should be familiar by now. Again, let VS create ProductIdNotCreatedException for you and have it extend the Exception object. Let VS insert a new constructor for ProductCreatedException and run the tests. They should all pass. In the next post we’ll take a look at how to verify class properties with Moq. We will continue our discussion of mocking objects using the Moq framework. You can check out the absolute basics in the previous post. In this post we’ll look at how we can test the return values of a dependency used within the system under test. We will extend our Product domain with a new property and we’ll let a dependency handle the construction of this new property. This property will be a unique ID. The expected behaviour is that if the ID is null then the Product creation logic should throw an exception. We’ll continue with the test-first approach. The concrete class that builds the ID must implement the IProductIdBuilder interface. Go ahead and let Visual Studio create the interface using the built-in techniques. Make sure it is created in the Domain project. Re-run the tests just to see if anything has broken: we get the same failing test as before. Run the tests and the new unit test should fail as BuildProductIdentifier() returned null. However, now we have another failing test: Then_repository_save_should_be_called() fails because Create throws an exception. See how useful it is to have a unit test? Let’s try and accommodate the changes. The call to mockIdBuilder.Setup means that when BuildProductIdentifier() is called then please make sure that a new ProductIdentifier() object is returned. This is because the CreateMany method of the ProductService doesn’t call the BuildProductIdentifier() method. We’ll revisit the CreateMany method later in the post. Run the tests again and they should all pass. The Setup method will be familiar by now. The funny looking () => null is the lambda way of saying that the return value should be null. The test still passes but now we’re giving concise instructions about our expectations. You may be wondering where the ‘Assert’ section is. It is actually expressed by the [ExpectedException(typeof(InvalidProductIdException))] header above the method signature. The meaning of this test should be clear from the previous examples. We want to make sure that Save is called if ID is not null. I.e. we want to make sure that calling the TryParse method of the mock object implementing the IManufacturerFactory returns true for any string parameter. Next we’ll set up our expectation that the ProductIdenfier object will hold unique ID values in each iteration. Add the following after the productId initialisation. This completes our discussion on mocking return values with Moq. In the next post we’ll look into how to verify arguments passed to the system under test and how to mock exceptions. Code that accesses external resources, such as databases, file systems, web services etc. In the last two cases you may even worry about how the unit tests are going to affect the external classes and resources. The good news is that these dependencies can be abstracted away and factored out with Test Doubles or Mocks. Test Doubles are objects that provide a simplified implementation of a dependency. One solution is to write a simplified implementation of IDataReader, maybe called InMemoryDataReader that doesn’t read a physical file. It instead uses a static list of in-memory data that you verified beforehand. That way you can be sure that the data that the method under test receives is perfectly valid. Also, if the unit test fails then you’ll know that it wasn’t due to the unavailability of an external file, but a failure in the processing logic. A similar problem arises if the method under test uses external objects and calls those objects to carry out specific tasks. A unit test that fails will again be of dubious quality. Something has failed, but we’re not sure what. With mocks we can fake those dependencies. If you don’t use any mocking framework then you will obviously need to write your mock objects by hand. If The method under test has 4 dependencies, let’s say 4 interfaces, then you’ll need to write at least 4 mock implementations in order to write a meaningful unit test. If there’s some complicated branching logic within the method then you may even have to write additional implementations of the interfaces that adhere to the different paths the code can take. The benefit of rolling your own mock objects is that you have complete control over how the mock implementations behave and that you don’t have to learn any new framework. The downside is that you increase the unit testing code base with every new mock object. As the unit tests are also part of the code base it also needs to be maintained – a larger code base means more code to maintain. Also, the complexity of mock objects will increase with the complexity of the code under test. An even bigger problem is the fragility of such mocks. They are subject to changes in the interfaces they implement. Before we jump into any code there’s a pattern associated with using mocks in the unit tests that you’ll need to know: Arrange-Act-Assert, aka AAA. These are three phases within the method body of a unit test. Arrange: set up the objects necessary to write a meaningful test on the method under test, i.e. this is an initialisation phase. Act: execute the method under test. We’ll simulate a ProductService class that creates new Products through a ProductRepository. We will test the ProductService class to demonstrate AAA and the most basic usage of a mock object. We’ll use the code first approach. This is the way to initialise a mock object that implements the IProductRepository interface. There’s no such interface yet, but you can create it using the techniques outlined here. First make sure that you create the Save method and the Product object using the built in Visual Studio tools. Setup means setting up our expectation(s) on the mock object. We expect its Save method to be called where the Save method accepts a Product object. In Moq all expectations in the Setup method will be formed using Lambda expressions. The funny looking It.IsAny just means any type of Product object. Let VS create ProductService and its constructor. Notice the Object property of our mock object. Moq builds a concrete instance of the mocked interface object for us on the fly and the Object property will extract this implementation. We never actually see it but we don’t care either. It takes the place of the hand-made mocks we may spend a lot of time writing. We call the Create method of the product service which accepts a ProductViewModel object. Go ahead and create those using Visual Studio. We use the View Model to communicate with the Service from the outside. This follows the strict policy of not letting the Domain objects bubble up to the projects above the Services project. Don’t worry if you haven’t come across this way of organising code, it’s not important here. Just accept that we don’t let our domain object permeate the entire solution. It’s another discussion whether this is good or bad but we’ll definitely not pursue it any further here and now. VerifyAll comes from the Moq framework. It means that every expectation we set up in the Arrange phase should be checked. Run the test again, it should pass. We can verify that Moq is not lying to us by commenting out ‘_productRepository.Save(product);’ in ProductService.Create. Run the test with that method call commented out and you should get a failing test. The Moq Verify type of assertions will test whether the system under test behaved according to our expectations. The ‘p => p.Save(It.IsAny())’ bit will be familiar from the Setup we had before. Then we specify how many times: exactly productViewModels.Count times. It is worth checking with IntelliSense what overloads of Verify exist. Run the tests and they should succeed. To extra-double-triple-check the behaviour replace ‘productViewModels.Count’ with 2 and the test should fail. In the next post we’ll look at how to mock return values. In this post we’ll look closer at the Refactor step of the TDD cycle. Refactoring means changing the internal implementation of a method or a class without changing the way the class can be consumed by others. In other words Refactoring shouldn’t involve changing the signatures of public methods, the name of the class, the existing constructors, i.e. anything that can be used externally. The changes you make should not break the code of the consumers of the class. These consumers include the tests as well, they should not be affected by the changes either. The benefit of having the tests in place is that you can easily check if the functions still work as they should after refactoring. What is all this fuss about refactoring? We wrote a failing test, then made it pass, implemented the method under test so we should be done, right? Not quite. This may be true of some extremely simple methods, like adding two numbers. In real life applications if you leave your code unattended after the first refactoring cycle then eventually it will very likely grow into a monster over time due to the lack of maintenance. Unless you always write perfectly S.O.L.I.D. code all the time of course, in which case you can stop reading this post. Think of everyday objects, such as a bicycle. You buy a bike and you may think: I can ride my bicycle every day forever after without any worries. In reality you will have to tend to your bike: oil the chain, change and pump the tires, remove the rust etc. If you don’t maintain your bike then it will decay over time. This is true of many other objects: cars, houses, computers etc., they all need regular maintenance and refinement. The code you write is also such an object. You cannot let it “rust”, you need to come back to it and ask some questions: does it perform well during stress testing? Is the method trying to achieve too much? Does it follow the Single Responsibility Principle? Can I break it down into smaller methods that each carries out one thing at a time? The following questions are just as important: are you going to understand your code when you come back to it after a year? Is it easy to follow? Is it well documented? Is the documentation up to date? Proper refactoring ensures that the answer to the questions is yes, or at least a lot closer to ‘yes’ than without refactoring. You may not always have the time to refactor your code and write unit tests. Developers are often pressed by deadlines, emergency bug fixes, change requests and the like. In that case you may cut corners by forgetting about TDD altogether. Keep in mind though that you will have to repay the short term time gain in the long term with interest. The extra time you will need later comes in different forms: time spent trying to understand the code, trying to change the code, fixing the new bugs that show up due to the lack of tests. We will build on the Calculator project we started in the previous post. We’ll expand it to make it a bit more complex as it’s difficult to meaningfully refactor the extremely simple methods and classes the project currently has. Select observations.xml in the Solution Explorer and press Alt+Enter. In the Properties window select ‘Content’ for Build Action and ‘Copy if newer’ for Copy To Output Directory. I will not go through the code in detail here as it is not our focus. Step through the code step by step using breakpoints and F11, it should be easy to follow. We will concentrate on Processor.cs and its LoadData() method. We pretend that we inherited this method from another developer. After all, you would not write anything like this, right? It’s only those other developers that don’t keep testability in mind who would put together such a method. The method performs many things: what do we test? The method is difficult to test: which part of the method do we test? If it fails, then where does it fail exactly? Hover above the rectangle with the mouse – or press Ctrl+’-‘ while having the cursor on the method name – and you’ll see a small context menu which allows you to rename the method. This will also rename the method where it is referenced elsewhere in the code, such as in Program.cs. If you don’t do this then you have to go through the entire project and rename the references as well. You can rename parameter names, classes, namespaces etc. the same way. In the Extract Method window set the method name to ParseMeasurements and click OK. You should see that the highlighted code was factored out to a separate private method. You can remove the ‘static’ keyword from the method signature. The variable observationList is now built using the ParseMeasurements method. …and replace ‘2’ with the ‘groupSize’ constant. The above changes were a great relief: they have brought with them a higher degree of maintainability and readability. You may well be aware of abstractions – polymorphism – in an object oriented programming language: abstract classes and interfaces. They are useful in many ways: they introduce loose coupling between classes, increase testability as you can pass in any implementation to the method under test, they help factor out common attributes of related classes and they also increase the extensibility of your classes as many different implementations can be added to the class. Let’s see what can do to improve the Processor class. We’ll first extract an interface from the Processor implementation. This will allow us to introduce different types of Processors in the future, ones that perhaps carry out the data aggregation in a different way. It will also enable us to pass in any IProcessor object into a method under test that is expecting an IProcessor parameter in its method signature. Then the unit test will not be tied to a single implementation. We could continue refactoring but we’ll stop here. The purpose of the post was to show you the importance of refactoring. In the next post we’ll start looking at a special topic within TDD: mocking. Mocking is important in order to build dependencies for the system under test. The framework we’ll use is called Moq. As your test suite grows you may run into a lot of repetitive code. If you’d like to test a method with a lot of different values then one solution is to copy and paste the first test and just replace the input parameters – goes clearly against the Don’t Repeat Yourself principle. To demonstrate how you can pass in several different parameters to the system under test we’ll start a new project. The code will of course not compile as we don’t have these classes and properties ready yet. Using the techniques we saw previously create them in the Calculator.Domain project. Run the test (Ctrl +R, A) and you should get a failing test as the Add method is not yet implemented. Recall, this is the first phase – Red. Run the test again and you should get a passing test. 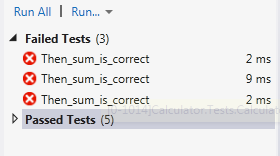 Correct the values in the TestFixture constructor as necessary to get 8 passing tests. So, we’ve got 8 tests for the price of one, that sounds like a good deal. This is useful when you have many more test fixtures which can be grouped. This adds another level in the test hierarchy. So far we’ve tested very simple values where we subconsciously assumed that the user will provide ‘good’ inputs, i.e. inputs that the Add method can handle. This is called the Happy Path. However, what if one of the parameters is int.Max? Adding something to int.Max will give unexpected results. It is important to keep in mind that we should also test inputs that our code should not deal with. Add a subfolder called ‘SadPath’ within the ‘Calculator_Tests’ folder. Add a class called When_adding_integer_to_maximum. The method name describes what we would like to see: the Add method should throw a NotSupportedException when passing in at least one int.Max value instead of returning a dubious result. Remember: according to the Red-Green-Refactor cycle this is a good sign. Re-run the tests and you’ll see that the test passes. It’s easy to guess what these are for: strings and collections. If you wish to make sure that a string parameter fulfils some condition then StringAssert has methods such as DoesNotEndWith or DoesNotContain. In case a Collection type of object, such as a List needs to be inspected then CollectionAssert has methods such as IsSubsetOf or IsEmpty. Thus there is a wide range of cases you can write tests for. This was a rather short entry on a couple of smaller topics in TDD that didn’t really fit in a larger post. In the next post we’ll continue looking at the Refactor phase.